Now here’s a place that fits in perfectly with its surrounds. Three Blue Ducks at the Farm is super-relaxed and informal, just like the whole NSW Northern River area. There’s no fancy schmansy or finery here, but that in no way means the food isn’t up to scratch, or the service. I have to say, it’s certainly different to the other Top 100s I’ve been to. Three Blue Ducks is situated literally on The Farm in Ewingsdale – a working biological farm about 5km from the heart of Byron Bay town. The food that’s served is driven by the availability of fresh, sustainable, local produce with many ingredients being grown on-site, including pork and beef. Head chefs Darren Robertson and Mark Labrooy have leveraged off the success of their well-known Three Blue Ducks restaurant in Bronte to open up at Byron Bay. The restaurant is large, seating around 90 people, and there’s also a bar and a produce store. It’s an ambitious project, being open 7am – 4pm Monday to Thursday and then breakfast, lunch and dinner Friday to Sunday. I had booked well in advance and we had a great table out on the verandah. It was a perfect evening for it – warm and still (and thankfully, no mosquitoes!). We were made to feel very welcome – all of the staff were extremely friendly. 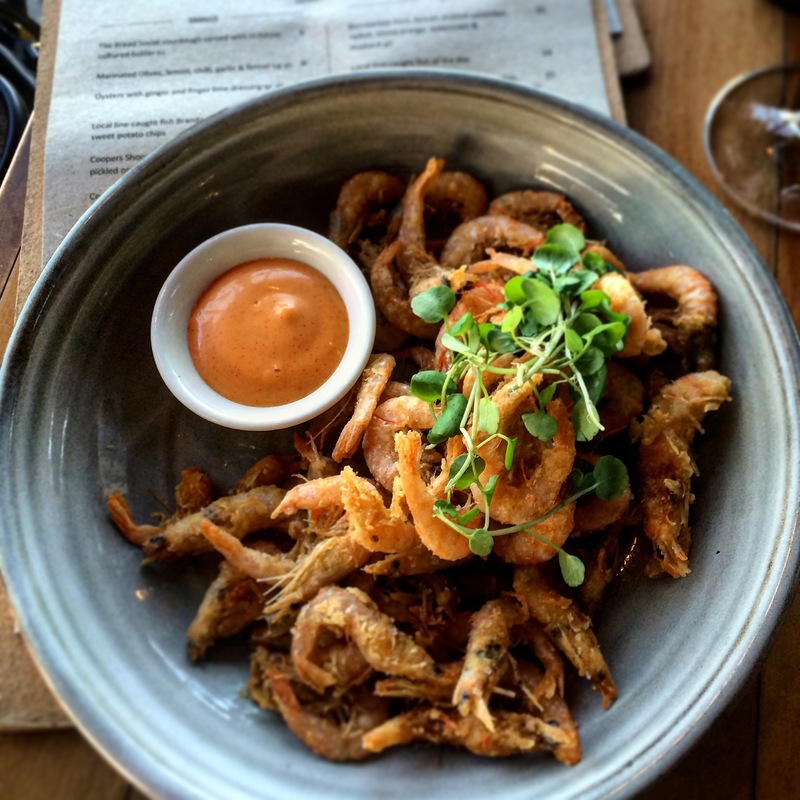 We ordered a plate of Clarence River school prawns with kimchi mayo, chilli and lime to start. I love school prawns – they’re so great to munch on over a drink and good conversation. These ones were so tasty and crisp. To accompany this we had the Kangaroo Tartare with eschallots, capers, cornichons, chives and olive crisp – good to see a kangaroo tartare and really nicely presented. For mains I ordered the 6 week dry-aged T Bone with chimichurri, mustard and lemon – a nice simple dish and a good piece of meat, cooked a perfect medium-rare. It came with a choice of side so I chose the Greens, garlic, ginger, sesame – these were simply stunning (I love my greens!). My partner had the New England Lamb, smoked eggplant puree, sugar snaps, beans, mint and preserved lemon and he loved it – it got the big thumbs up. We accompanied our meal with a carafe of Brash Higgins natural Nero d’Avola. Yes, they pour their wines into carafes from the taps in the bar – and that’s means good wines at low prices. This one was 700ml for only $35. And to finish, the Fruit Bread, miso butterscotch, ice cream and honeycomb. We couldn’t fault the service, the setting was beautiful and the food was really tasty. We enjoyed it so much we dropped in to have brunch two days later but it was literally swarming with people (with a big line-up) so we had to go elsewhere. Three Blue Ducks is definitely a positive addition for the Byron Bay area.